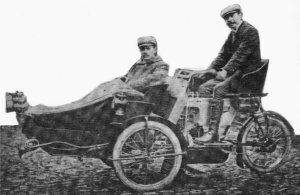 The Garrard “Suspended Tri-car” was manufactured in 1904 by the Garrard company who also built the Clement-Garrard motorcycle. Power was provided to the single rear wheel by a chain. It is believed that not many of these machines were built and that production ceased in the same year.